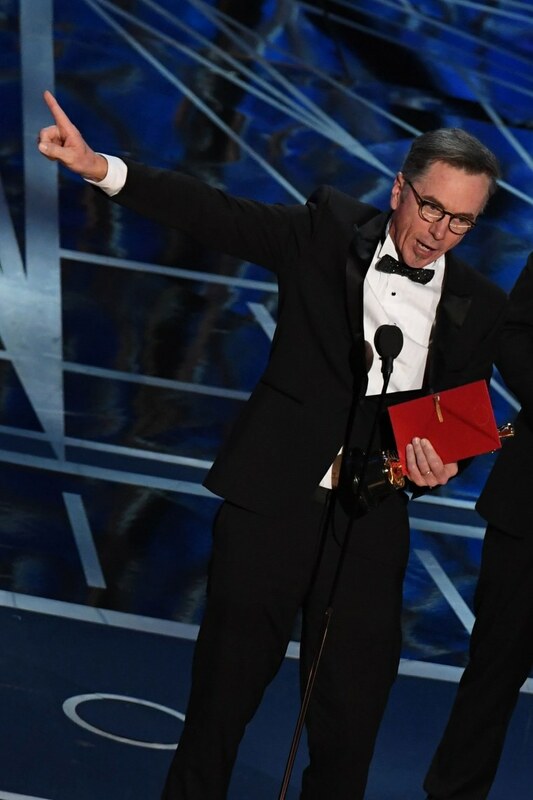 The 21st time was the charm for Hollywood sound mixer extraordinaire Kevin O’Connell who finally made his first trip to the stage at the Academy Awards. O’Connell held the record for the most number of Oscar nominations without a win, his first coming in 1984 for the tear-jerker “Terms of Endearment.” He subsequently worked on films ranging from “Top Gun” to “Transformers." O’Connell, 59, was recognized for his work on the Mel Gibson war movie “Hacksaw Ridge." "I can't even tell you the experience it was for me," O'Connell said backstage after the victory in the best sound/sound mixing category. "As much as I thought I knew what it would feel like [to win an Oscar] I didn't. It was the greatest feeling in my entire life." O'Connell admitted he had grown accustomed to his losing streak. "I wasn't expecting it to happen," he said. Speaking to NBC News in the run up to Sunday's awards, O'Connell admitted that he had "been called the Susan Lucci of the Academy Awards,” referring to the actress who played the devious Erica Kane on the long-running soap opera “All My Children” and needed 19 tries before she finally took home an Emmy. His win was a modest upset, as many pundits had pegged musical "La La Land" to waltz off with the prize. O'Connell will share the Oscar win with Andy Wright, Robert Mackenzie, and Peter Grace. It's the first Oscar for all four men. Born on Long Island and raised in Los Angeles, O’Connell’s dream as a child was to be a firefighter — not a sound mixer, whose job is to record all the sound recorded on the set while a movie is being made. Starting off as an apprentice, O'Connell learned the craft and got his first credit as a recording technician in 1980 for "Star Wars: Episode V — The Empire Strikes Back." He earned his first credit as sound mixer on the 1982 Steve Martin comedy "Dead Men Don't Wear Plaid." From then on, O'Connell worked on some of the biggest movies to come out of Tinseltown, including all three "Spider-Man" movies (two of which earned him Oscar nominations). When asked which of his 21 nominated films was the most difficult, O'Connell said: "I'm gonna go back to 1986 with 'Top Gun.' It was an incredible amount of work, a huge undertaking, we didn't have automation that we do now that helps us do our job. [That was] by far the most difficult film I've worked on."